PayDeck.in is an online service which makes sending money easy. Using PayDeck, you can send money or pay somebody using your credit or debit card. The most prominent attraction of PayDeck is that you can send money from credit card to a bank account, no wallets involved. Using a credit card to withdraw cash at ATM is a costly affair. PayDeck makes it easy by allowing you to send money to a bank just as you use your credit card online. We all have been in situations where we are out of cash, but a critical payment comes up such as house rent, tuition fees or the cost of repair for the car which suddenly breaks down on you. We have a credit card, but withdrawing cash from credit card involves a lot of charges and cash advance is also limited. You can only withdraw around 30% of your credit limit as a cash advance. So, what to do in this situation of no cash and a credit card with limit which you can’t use? PayDeck comes to the rescue! 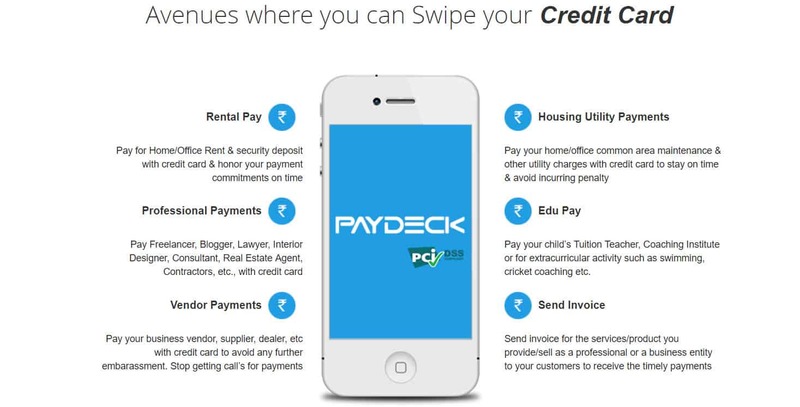 PayDeck is designed for both, the service providers and the service consumers. As a service provider, you can use PayDeck to generate an invoice and receive payment from your customer. On the other hand, as a consumer, you can send payment directly to the bank or phone number of the service provider. And all of these transactions can be made using credit as well as a debit card. Hence, PayDeck bridges the gap between consumers who wish to pay using a credit card and the service providers who do not have the equipment to accept credit cards. What more? You will also be eligible to receive the reward points as per your card issuer’s rewards program. Note: You should not use PayDeck to send money from your credit card to your bank account. It is prohibited and may result in the closure of your PayDeck account. Where can you pay using PayDeck? Fees/Charges & How to get started? This is just a short list to help you get started. You can ideally pay for any service you can think of, directly from your credit card. Ensure that you’re capable of proving the payment in case you’re asked about it. So, try to get an invoice from the receiver wherever possible. There are several costs involved in running such a service. These include the charges for maintaining the servers, the costs of hiring staff and developers and also the expenses of payment processors. So, since it is costly to support a service like this, PayDeck is not free. It charges a small fee which will never exceed 2.5% of the transaction amount. The exact convenience fees to be charged is displayed when you try to send a payment. You also have the option to choose the person who will bear the charges. It can either be borne by the sender or the receiver. And if that doesn’t work out, the convenience charges can be split and shared 50-50 by the sender and the receiver. 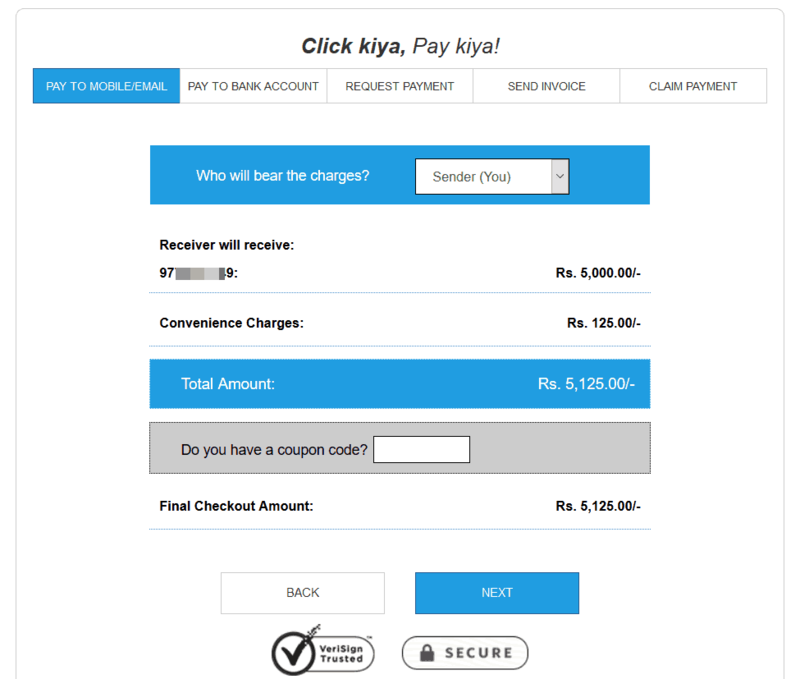 I tried to send a payment of ₹5,000, and the convenience charges amounted to ₹Rs. 125. This is the same 2.5% if converted to percentage terms. Creating an account on PayDeck is much more comfortable than creating a Facebook account. It will only take a couple of minutes, and you can start sending money immediately after account creation. Simply fire up PayDeck.in in your web browser, fill your name, email and phone number. Then submit the OTP received on your mobile phone to complete the signup process. What do you need? You will need: a mobile phone number and email address to create your PayDeck account. You also need to input your PAN card number before you can start sending or receiving money. Ensure that you use the name as per your PAN card to create your account. As a regulatory requirement, PayDeck might require you to provide a copy of the PAN card before remitting the money to the bank account of the service provider. PayDeck is not a wallet service. Hence, you do not need to load money to a wallet and then send to the receiver. Instead, it is a payment solution wherein the money is debited from your credit/debit card and sent over to the bank account of the receiver (service provider). How much time will it take? All payments are settled using NEFT. The usual time is 48 hours, but some cases may get delayed due to problems with the payment processor and the type of credit card used. In any case, PayDeck claims to complete all transaction with T+4 working days. “T” here refers to the day on which you initiate the transaction. 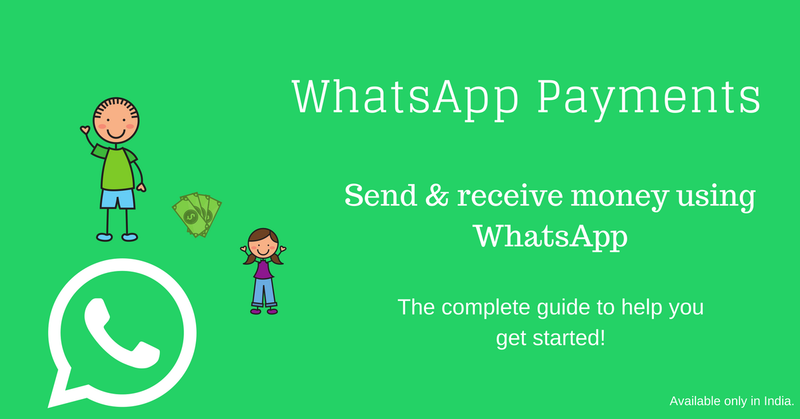 WhatsApp Payments – What it is? How to enable? & How to send money? Used it recently after reading your review. Good service. Better than Paytm or payzapp if you are not in hurry for payment. Its economic and more over customer support is best. in Paytm I have to stay waiting for a simple response. I used Paydeck for payments and experience was great. Thanks for sharing. Charges are 2.5%. Paytm charges are 3%. Payzapp charges are 2%+ tax. Paydeck charges are 2.5% inclusive gst. But good thing is Paydeck is not a wallet or something which has any issues. Simple & most importantly pay for any invoice or merchant or supplier payment for whatever amount it is. As U said right.. after only doing the Kyc documentations etc. Good. Using Paydeck for 1 year. Thanks for sharing at fb page. Only problem is you people don’t advertise about the service. You should have refer a friend bonus. I have acted as a brand ambassador & 18 of my friends who are either local traders or are selling with me on flipkart and Amazon are on Paydeck.in because of me. But great service and timely payments to my suppliers are making things better. As other comment said overdraft not required is true. Great for small businesses.